Evergreen shrub of densely bushy, well branched habit with sturdy stems. Oblong, 15cm, leathery dark green leaves. 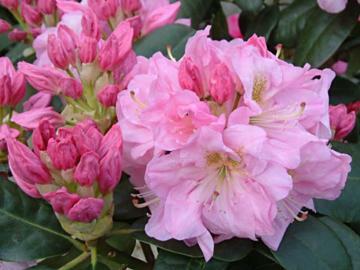 Large trusses of funnel-shaped, wavy-edged, purplish pink flowers with greenish yellow markings in the throats, opening from darker buds in mid spring. Moist, well drained, humus-rich, acidic soil in part shade. Likes fairly cool growing conditions. Charles Dexter hybrid, Cape Cod, USA.